Louise Coaesm, Lynette Macdonagh & Sinead Butler from Dublin arriving at Ballinlough Castle, Clonmellon, Co Westmeath for the 2014 Body&Soul Festival. Body and Soul at Ballinlough Castle, Clonmellon, Co Westmeath for the 2014 Body&Soul Festival. Sharon Green makes final preparations to her butterfly installation at Ballinlough Castle, Clonmellon, Co Westmeath for the 2014 Body&Soul Festival. 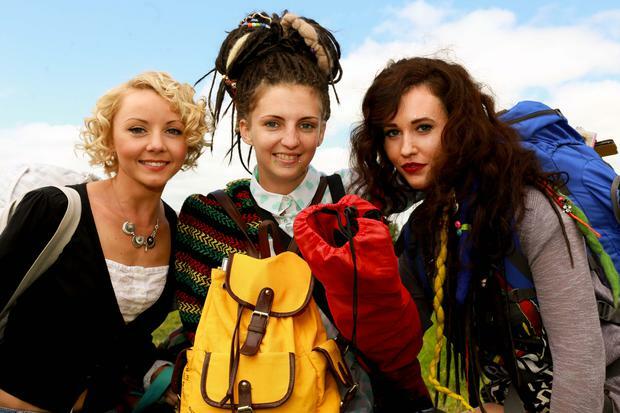 The first day of Body & Soul kicked off under a sunny sky as 2000 revellers descended on the picturesque grounds of Ballinlough Castle in Co. Westmeath. The fun began for many on the scheduled buses running from Dublin city centre. Most pulled off with a loud cheer before joining the convoy to the summer solstice music festival. It's the fifth year of the three-day festival which tags itself not as simply a music festival but a holistic festival that's as much about rejvenating body and soul as catching acts like Goldfrapp and Gary Numan. As you enter the grounds it really is like being transported to another universe, more like a boho spa retreat than your traditional mudfest. Some of the most popular options open to visitors are morning yoga and meditation and hot tubs by the lakeside, especially tempting when the weather is expected to remain warm all weekend. Attention to detail is stunning. Lush forested areas are decorated with twinkly lights and art installations as colourful butterflies flutter on trees. At every turn there's another surprise. Body & Soul is one of the only festivals that truly feels boutique and many fans return year after year for the banter and craic and relaxation as much as the acts. That said, there's a buzz on site about eclectic acts like John Hopkins and Darkside. As the evening descends on the first day, the sense of excitement is palpable.